The anniversary of Solzhenitsyn’s exile…. ‘I dedicate this to all those who did not live to tell it. And may they please forgive me for not having seen it all, nor remembering it all, for not having divined all of it’…Forty four years ago, Alexander Solzhenitsyn (1918-2008) the Russian author and historian whose words in the dedication of his book The Gulag Archipelago, the epitome of anti-Soviet writing, found himself forcibly removed from his home and family by the KGB and sent via prison, to West Germany. 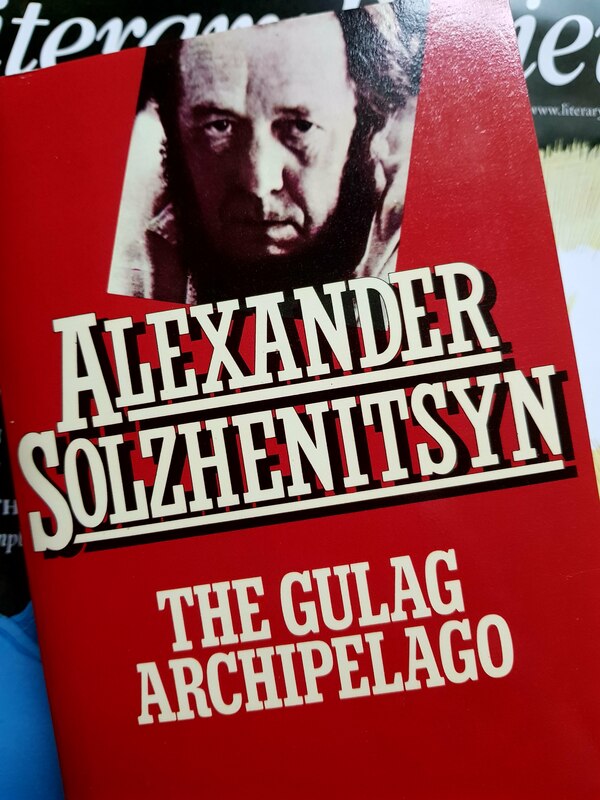 It was a classic Soviet Union response to criticism of its leadership, Solzhenitsyn had spent years gathering and hiding information about the infamous prison system and Gulag labour camps under Lenin and Stalin of which he had personal experience. The book brought to the international fore the plight of some 227 inmates whose own testimonies rendered useless any attempts by the State to discredit it. Solzhenitsyn showed how dependent the Soviet system was on the threat of imprisonment (or worse) as well as the productivity gleaned from the labour camps, to maintain yet alone develop, the country’s infrastructure and its iron grip on its citizens. His voice was critical to the dissident movement and by February 1974, with the KGB’s brutal acquisition of his book, his residency in his homeland came to an end. Solzhenitsyn had wanted the book to be first published in the Soviet Union but following the bloody interrogation and subsequent suicide of Elizaveta Voronyanskaya, his friend and one of the typists of the manuscripts he agreed to its publication in France. This was no ordinary book, he lived and worked under constant surveillance by the authorities, only able to work on parts at a time for fear of reprisal. The final draught had to be smuggled by microfilm to Zurich for publication where all of the royalties were given to former Gulag prisoners via the Solzhenitsyn Aid Fund. It was a book which lay dormant for five years for fear of reprisals against those whose names and contributions appeared in it and by the end of 1974 a full scale operation to discredit Solzhenitsyn was orchestrated by the then KGB Chief Yuri Andropov, including a swathe of books and articles making feeble and futile attempts to pour scorn over unassailable facts. Most notable of all, perhaps, was the Andropov-inspired memoirs of his first wife, Natalya, who stated the books importance had been ‘overestimated and wrongly appraised’. The book’s influence was far-reaching, in her fine book Gulag: A History, Anne Applebaum describes how many on the French Left converted to an anti-Soviet position following its release and led to a re-evaluation of Lenin throughout Western Europe for it was Lenin, rather than Stalin, whom Solzhenitsyn levelled most criticism as the originator of the system. But most crucially, the book gave voice to those who suffered the terrible beatings, near starvation, bitter winters and horrendous living conditions. It was a book for them and the beginning of a sixteen year exile for him. It is a remarkable book on so many levels and a notable anniversary to remember, an important stain on a bloodied Soviet flag. With thanks and appreciation to Malcolm Marshall Esq.